If you’re under 30, TV probably means Netflix. Nearly two-thirds of young adults in the U.S. get their episodic #content via a streaming service rather than cable or broadcast; Netflix alone has vowed to produce 700 original series this year alone. And yet the series that is most evocative of the streaming era airs its episodes the old-school way — once a week, starting in the fall, during NBC’s throwback Thursday night “Must See TV” block, once home to genre-defining sitcoms like Cheers, The Cosby Show, Family Ties, Friends, and Seinfeld. Created by veteran TV writer Michael Schur, The Good Place is an ostensibly heaven-set show about what it means to be a good person, or at least to try. But, after nearly three seasons and multiple conceptual leaps, The Good Place feels less like a show about ethics and more like a simulation of the experience of watching TV in the streaming age. It’s not about heaven and hell; it’s about the internet. The sitcom’s first season, in which four constitutionally mismatched people find themselves in what they believe to be heaven, ends on a twist: Eleanor (Kristen Bell), Chidi (William Jackson Harper), Tahani (Jameela Jamil), and Jason (Manny Jacinto) have actually been in hell all along, torturing each other at the behest of an affable demon named Michael (Ted Danson). The current third season shifts the action back down to Earth, as Michael gives the foursome a do-over in the hopes that they’ll become better people and land in the real “Good Place” when they die. Like another heaven-set series, Amazon’s Forever, The Good Place is never quite what it seems. There are seemingly endless iterations of its premise. As TV slips further and further away from a traditional broadcast model to one in which episodic entertainment is available online at any time or place, it’s appropriate that the most critically celebrated network comedy is one that is governed not by the rules of a classic fixed-set sitcom, but the limitless abstraction of the internet. Typically, a sitcom takes place in a relatively static location: that impossibly large West Village apartment on Friends; Seinfeld’s go-to diner, now a New York City tourist landmark; the namesake bar of Cheers. 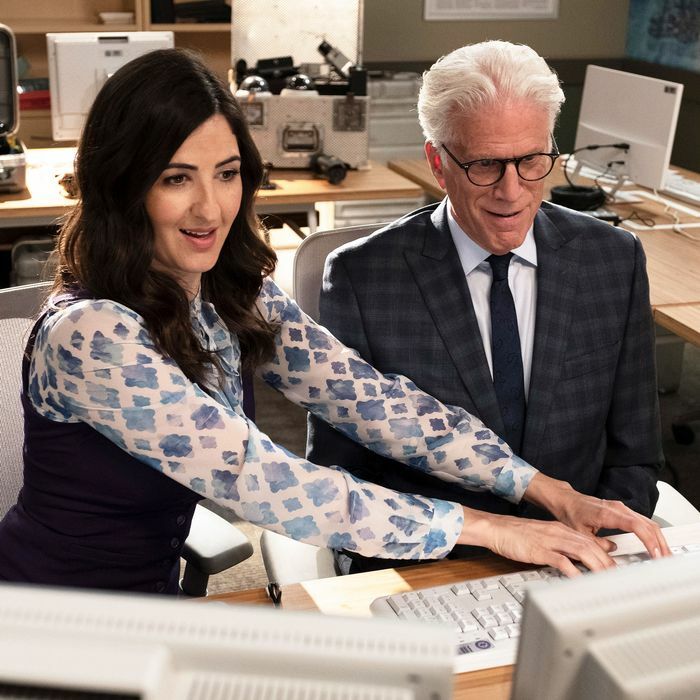 But The Good Place has no similar set in that sense (the Siri-like celestial servant Janet, played by D’Arcy Carden, lives in a “boundless void”). The ground beneath the characters’ feet is constantly shifting, just as the show’s very concept shifts with every season — and, to some extent, nearly every episode, a tactic that mimics the immeasurable expanse of online space. The conceptual shifts on The Good Place echo the digital-era displacement of the way we watch TV — not in a fixed time and place but everywhere, always. The rapid changes in TV distribution and consumption we’ve seen over the past five years alone have resulted in what has been one of the most destabilizing aspects of the streaming era: With seemingly endless choices available to anyone with a Wi-Fi signal, TV is no longer a reliable guide to the seasons. Life is one long seamless scroll, and we’re all living in our own little timelines, watching what we want when we want — alone, together. After all, streaming may encourage isolation among TV viewers. Studies have shown that people are more likely to binge-watch by themselves; you can be in the same house as both your spouse and your kid, and yet all be watching different shows on different glowing rectangles. But along comes The Good Place, a network sitcom bound by the idea that humans are happier, healthier, even nicer when we resist the urge to shut out the world and burrow into our bad habits. In the philosophical words of Chidi, “We choose to be good because of our bonds with other people.” When the streaming demons conspire to tear us apart, The Good Place is here to remind us that, at its best, TV can still bring us together.